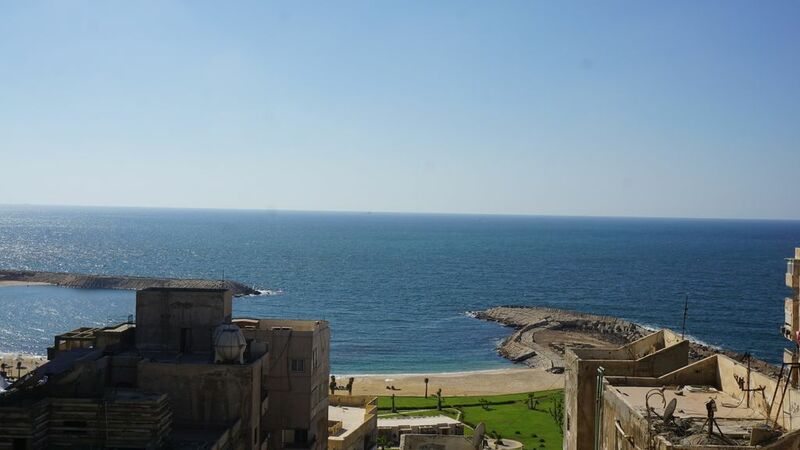 This Apt is Located in the heart of Alexandria with a breath taking sea view from the 13th Floor. Everything you can imagine is literally right downstairs; apt is next to the four seasons hotel with a 5 min walk to 2 private beachesThere is also free high speed WiFi and a nice 32" LCD TV with of course a washer, dryer and microwave all located in an American style kitchen with a nice dining area. An office desk is inside the larger bedroom. One bedroom has a king size bed and the second bedroom has 2 double beds. The flat does have 2 bathrooms but only one has a bathtub and shower, no shower in the second bathroom. Transportation is easily accessible as well as the Tram station is right downstairs and will take you to the most important areas in Alexandria. Taxis are also available for a very cheep price.